German Wine & Dine - This month we're having a late Oktoberfest celebration and highlighting German wines and cuisine. It's even more special because our German Wine & Dine event has been chosen for FoodBuzz's 24, 24, 24, a culinary event that highlights unique meals occurring around the globe during a 24-hour period. We've got an amazing feast in store so stay tuned! Apple Orchard Field Trip - Friends and I are taking advantage of the fall weather in the country by taking a road trip to a local apple orchard. Check back to see our restaurant review of Marilyn's Bakery & Cafe and what culinary finds we come across at the orchard! I absolutely love movie theater style with butter and salt! 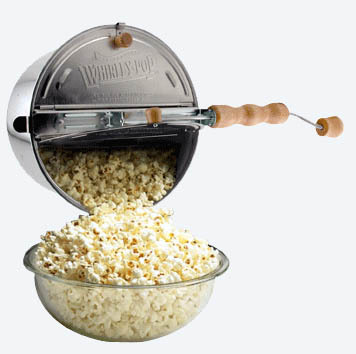 My second favorite is fresh popped kettle corn. Congratulations to Jenn! 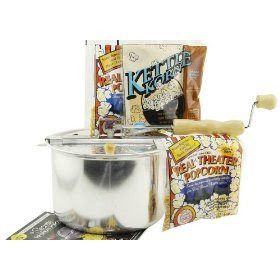 Please email me at [email protected] so I can have the Whirley Pop Gourmet Popcorn Set sent to you! Thanks again to all those that commented and stay tuned to the next Foodie Freebie announcement on Monday, October 126, 2009! Don't feel discouraged if you haven't won yet - I have a whole year's worth of freebies ahead and next week is one that you won't want to miss!